Today I’m happy to be partnering with OXO for their Bake A Difference campaign in support of Cookies for Kids’ Cancer, a non-profit organization founded by two OXO employees inspired by their son’s battle with cancer. 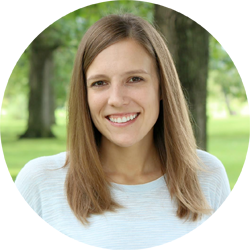 During the month of September, OXO is donating $100 to Cookies for Kids’ Cancer for every blog post that is dedicated to this campaign. If I can help by baking, I will! 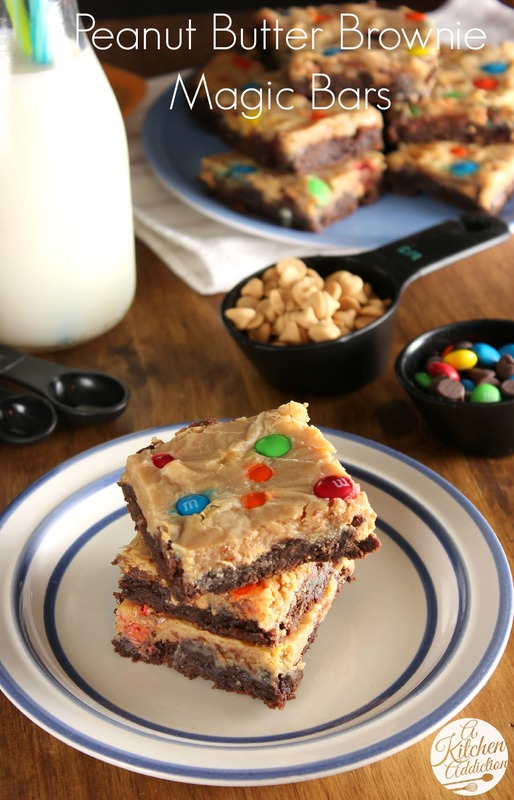 What better dessert to make for kids than brownies, brownies with peanut butter that are topped with M&M’s! These peanut butter brownie magic bars are irresistible. 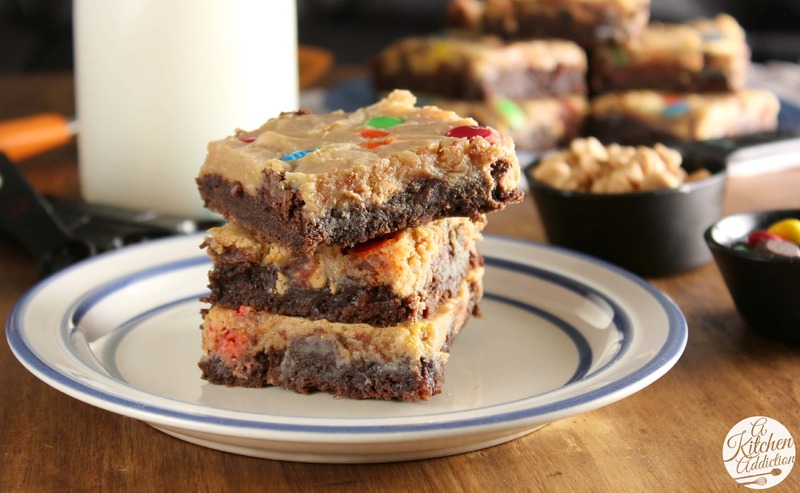 The rich fudgy brownie base is topped with a peanut butter and sweetened condensed mixture. You really can’t go wrong when sweetened condensed milk and peanut butter are involved. Throw in some peanut butter chips, chocolate chips, and M&M’s, and you can’t help but have seconds! Along with donating money for this post about tasty brownies dedicated to Cookies for Kids’ Cancer, OXO is also donating 25 cents per specially marked item in support of pediatric cancer. This is part of a $100,000 pledge to Cookies for Kids’ Cancer in 2013. Look for specially marked OXO products at participating retailers! Preheat oven to 350. Lightly spray a 9x13 baking dish with non-stick cooking spray. In a large sauce pan, melt butter over medium heat. Stir in sugar until sugar starts to dissolve. Remove pan from heat. Add eggs one at a time stirring after each addition. Stir in vanilla. Mix in baking cocoa and beat until well-blended. Add baking powder, salt, and flour. Stir until well-combined. Pour batter into prepared baking dish. Sprinkle with peanut butter and chocolate chips. Stir together sweetened condensed milk and peanut butter. Pour over the top of the chips. Bake for 20-30 minutes or until edges of bars start to turn brown. Allow to cool completely before cutting into bars. I was not compensated for this post. I received product to help support the Bake A Difference campaign. As always, all opinions are 100% my own. *100% of proceeds raised by Cookie for Kids’ Cancer fund pediatric cancer research. Here I am, trying to be good so I look nice for my wedding and then you post this and I’m like… “hmmm I could totally make these for my parents anniversary… then there could be some leftovers for me….” They look great and it’s fantastic that a company is donating money for pediatric cancer research. Such a great cause to bake for, and these magic bars are awesome! All the good stuff in there. These look really good, I think my husband would fall in love with me all over again if I made these for him. Question regarding the recipe – do you keep the pan on the heat while you add in the sugar, eggs, vanilla, etc. or is the pan on the stove just used to melt the butter? Thanks for catching that! You remove the pan from heat after stirring in the sugar. Thse are a sweet tooth lover’s dream! What a great cause too. Rock on lady. I’m dead. I want them all!!! These brownies look insanely good – I’m powerless when it comes to chocolate + peanut butter anything! 😉 Love this cause too, good for you!! I think I would need a glass of milk to go with one of those deliciously decadent bars! They look great! Can you please send me a dozen of these?! These look amazing and a great cause to bake for! Deliciousness..
What a great and important cause…and what chewy and yummy cookies. Thank you for sharing. What a delicious way to end my weekend and start my week. These look so gooey and delicious! I love any dessert combining peanut butter and chocolate, so I’m sure I would be a BIG fan of these magic bars. I especially love that you incorporated both chocolate chips AND peanut butter chips. Yum! I want to reach through the screen and steal the entire pan of brownies. These look perfect. These certainly do look magical! SO YUMMY! What a delicious-looking treat for such a great cause! 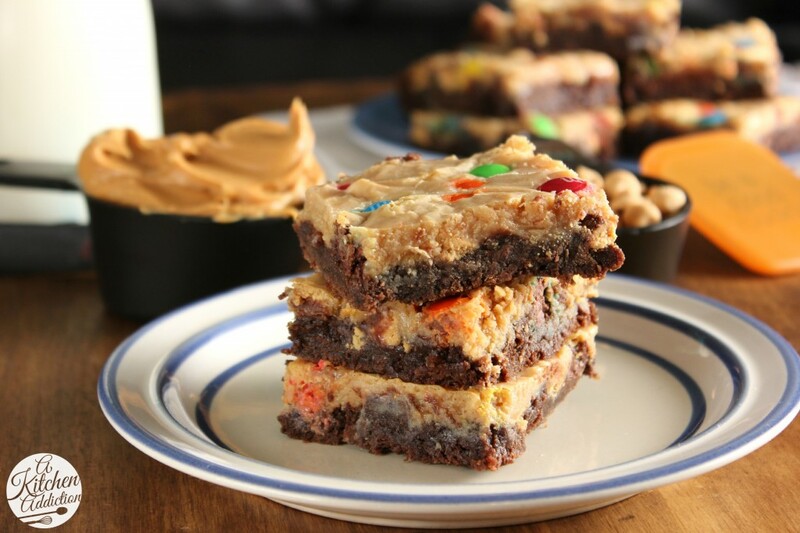 That combination of brownie base with peanut butter cookie-ish topping looks irresistible! I am pinning so that I can recreate this treat! I just love layered bars like these, and the M&Ms make them so festive! What a bonus that they benefit a great cause! Soooooo yummy! They turned out perfect! One question – do they need to be refrigerated? I’m so glad you liked them! I don’t think they would need to be refrigerated. When I’ve made them, it’s been for lots of people and they usually get eaten up within a day or two.